I’m crouched low, slowly creeping through young ferns and cedars toward a shaded pool, where my instincts tell me a brown trout should be resting. Sunlight and reflections dapple the surface of the water. In the shadow of the bank, the sandy, leaf-littered creek bottom looks bronze. Freezing against a tree trunk, I concentrate on the patches of bronze, looking for movement. After a few seconds, I can make out the shape, then the speckled, grey back and splash of gold on the sides, holding near the bottom. Perhaps 14 inches long, and just over a pound. I raise my camera, and try to slide surreptitiously into a better position. With a quick flip of its tail, the fish is gone. This isn’t Algonquin Park, the Madawaska Highlands, or Upper State New York. 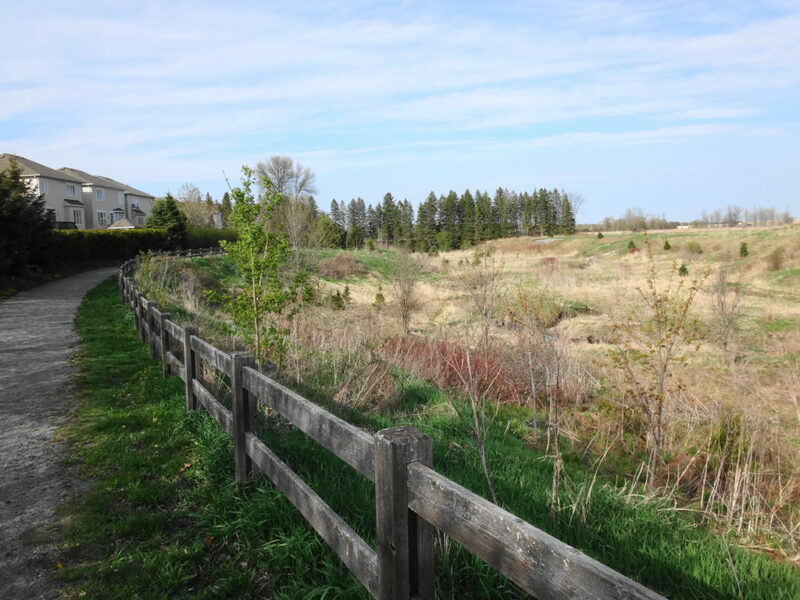 This is Poole Creek, in the heart of Stittsville, one of Ottawa’s rapidly growing suburbs. Like many people, I first visited Stittsville around 1980, on a Sunday family outing to the village’s famous flea market. It was a small bedroom community clustered along its Main Street. Since then, the village has merged with the City of Ottawa and grown into a busy suburb of 27,000 people, with more development and homes appearing every year. As the village has grown, it has displaced much of the farmland, forest and wetland that once surrounded it. 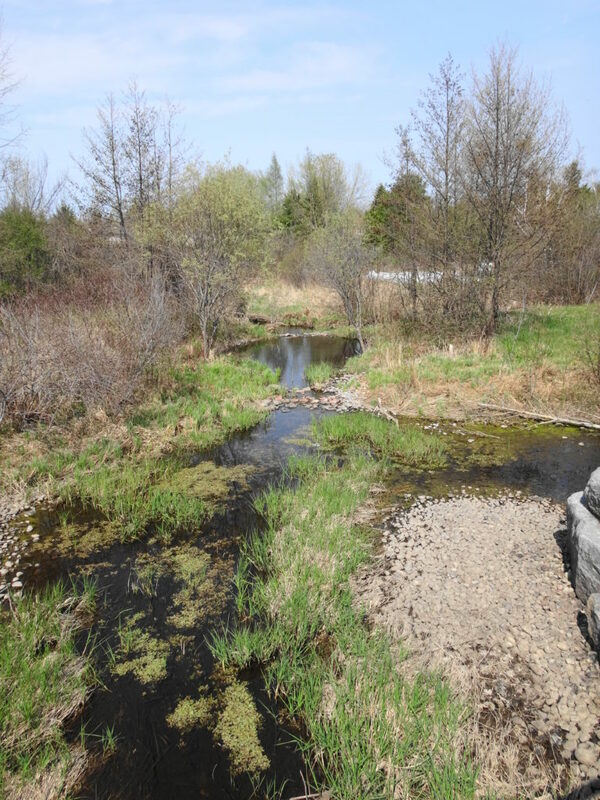 Fortunately, throughout all of that growth, the community has had the wisdom to preserve Poole Creek — one of only two, truly cold-water creeks in the Ottawa area. 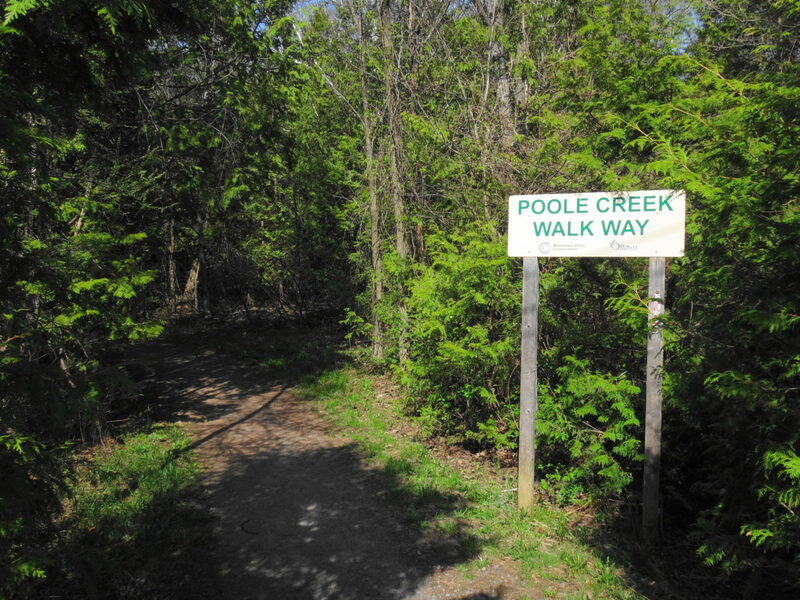 Poole Creek originates in the provincially-significant Goulbourn Wetland, about 1 km west of Stittsville along the Trans-Canada Trail. An observation platform looks north over a large expanse of cattail marsh, while the creek begins its life flowing south under the trail through a steel culvert. Barn swallows nest below the platform, and a careful observer might spot a well-camouflaged snipe probing the exposed mud flats with its long bill. Common yellowthroats — pretty, masked warblers — call “witchitty, wichitty, witchitty” from the thickets. Local residents familar with the Goulbourn Wetland will have seen recent changes to it. 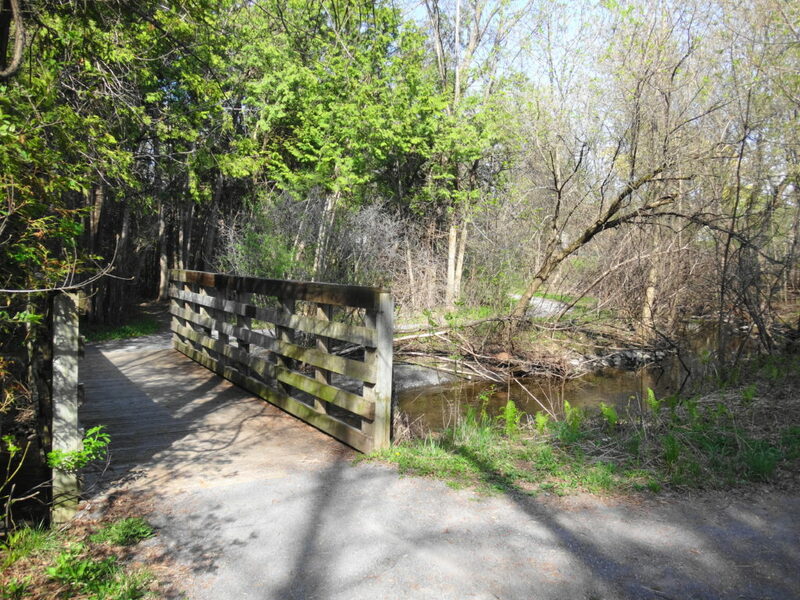 Water levels in the wetland have dropped since the City of Ottawa Drainage Unit and Roads Department replaced the collapsed culvert under the trail. The culvert, and the beavers that habitually dammed it, had created a substantial pond extending into the marsh. The replacement of the culvert and routine trapping of the beavers by the City has been controversial. Whether justified or not, the resulting changes to the wetland need to be assessed in an historical context. Aerial photography prior to the 1990s, when beavers recolonized the area, shows that much more of the wetland existed as swamp — suggesting that water levels were lower at that time. In all likelihood, the wetland has probably gone through many changes since European settlement, as beavers were trapped out, the railroad built (the bed of the current trail), farms cleared and then abandoned. The wetland will likely change again as it adjusts to the lowered water levels, perhaps seeing the conversion of marsh to swamp. However, there’s little danger of the wetland vanishing, given the low topography of the area and size of the contributing catchment. 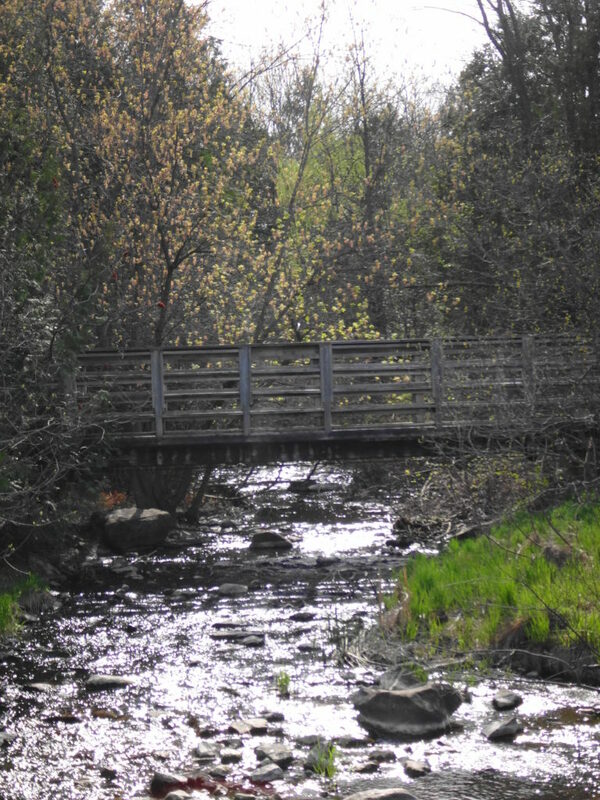 The Goulbourn Wetland and surrounding areas actually contribute very little to the flow of Poole Creek, except during the spring runoff and large storms. Outside the wetland area, the thin, clay and till soils dry out quickly in the summer months. 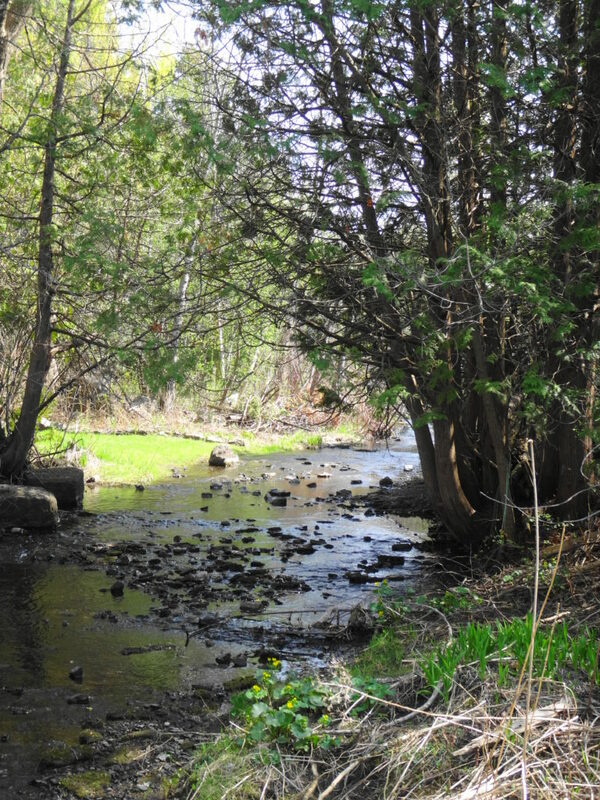 Even before the culvert work and lowering of water levels in the wetland, Poole Creek west of Stittsville was classified as “seasonally intermittent”. In dry summers, lengthy portions of the channel cease to flow, and minnows cluster in isolated pools as easy prey for birds and raccoons. Shortly after flowing under Westridge Drive into Stittsville, Poole Creek changes character. The western side of Stittsville lies along a relict beach of the ancient Champlain Sea, which covered much of the Ottawa Valley following the retreat of the glaciers 10,000 years ago. Rainfall infiltrates more easily into the sandy, beach soils than the clay and till soils that dominate most of the City. Rather than running quickly along the surface, the water percolates slowly through the earth toward Poole Creek. By the time that it seeps and wells up into the creek channel, the water has cooled to the temperature of the deeper soil. 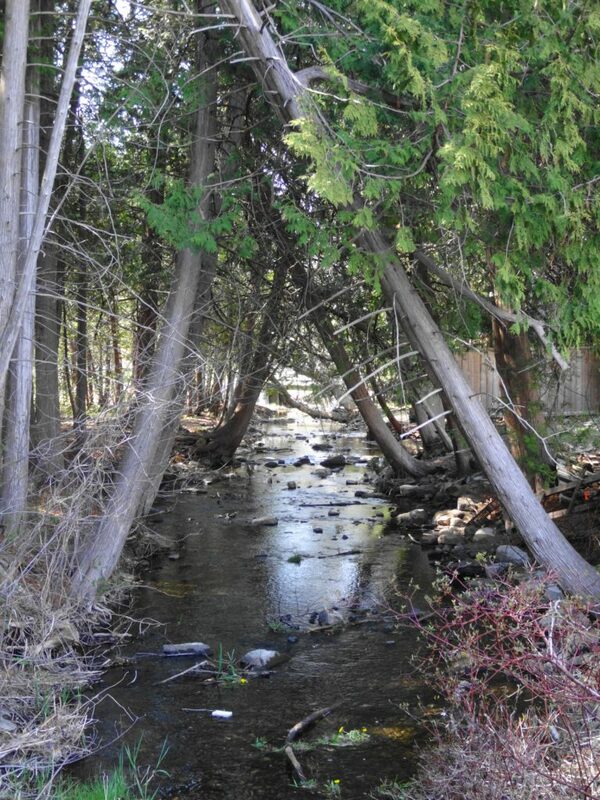 Consequently, once it enters the village, Poole Creek quickly changes to a permanent, coldwater stream. From Westridge to its mouth at the Carp River, five kilometres downstream, Poole Creek meanders through the village in a mostly natural corridor anywhere from 30 meter to 70 meters in width. Immediately upstream and downstream of Stittsville Main Street, a healthy canopy of trees overhangs the creek. Short riffles alternate with deeper pools. Here, in the clear, cold water, local organizations introduced brown trout about twenty years ago, constructing “lunker boxes” for shelter and stabilizing the banks to improve the habitat. The trout remain, virtually unknown to anyone but a few fly-fishers, who practice a careful catch-and-release to preserve the small population. 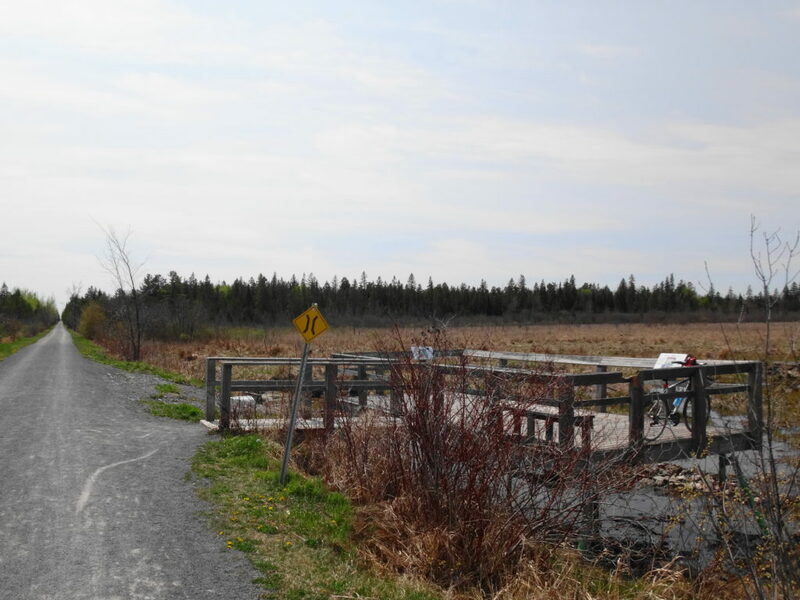 Although the Trans-Canada Trail deviates from Poole Creek at Westridge Drive, another trail system picks up from it, following the creek in fits and starts for much of its length toward the Carp River. 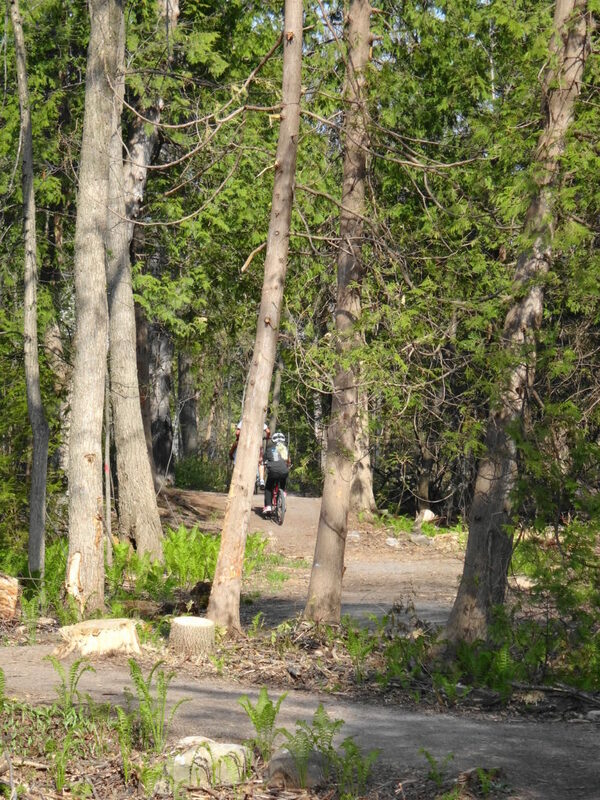 However, any visit to Poole Creek would be incomplete without a detour to Quitters Coffee, where the Trans-Canada Trail crosses Stittsville Main Street. Just a block or so south of Poole Creek, Quitters makes great pastries and sandwiches, while selling the best coffee in Stittsville. You can sit in the spacious, bright cafe or relax outside on the patio. With any luck, you might meet the owner, singer-songwriter Kathleen Edwards. Just east of Main Street, Poole Creek turns north and dissappears into a large remnant of Stittsville’s once extensive wetlands. Almost inaccessible, the wetland remains largely unsurveyed and uninventoried. 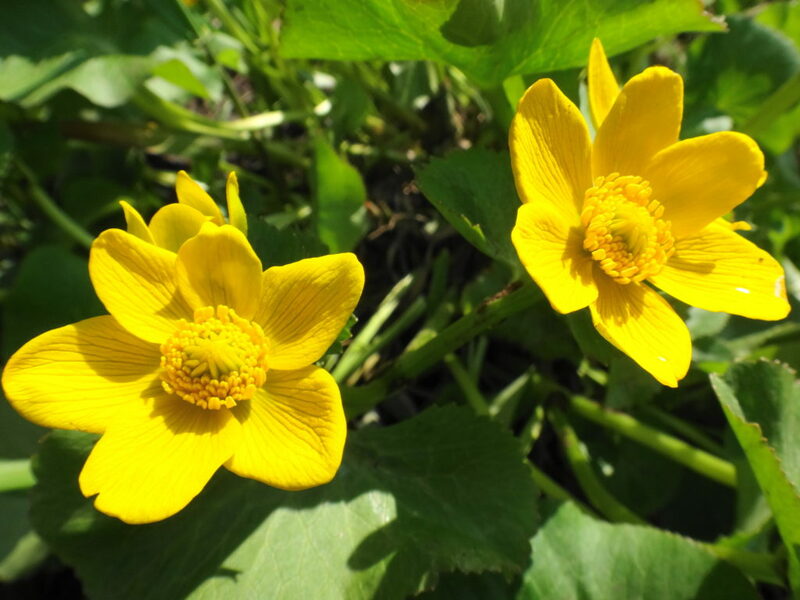 However, I suspect that an bioinventory would likely reveal several species at risk, especially Blanding’s turtle, which is known from the Goulbourn Wetland Complex and several isolated observations elsewhere in the village. 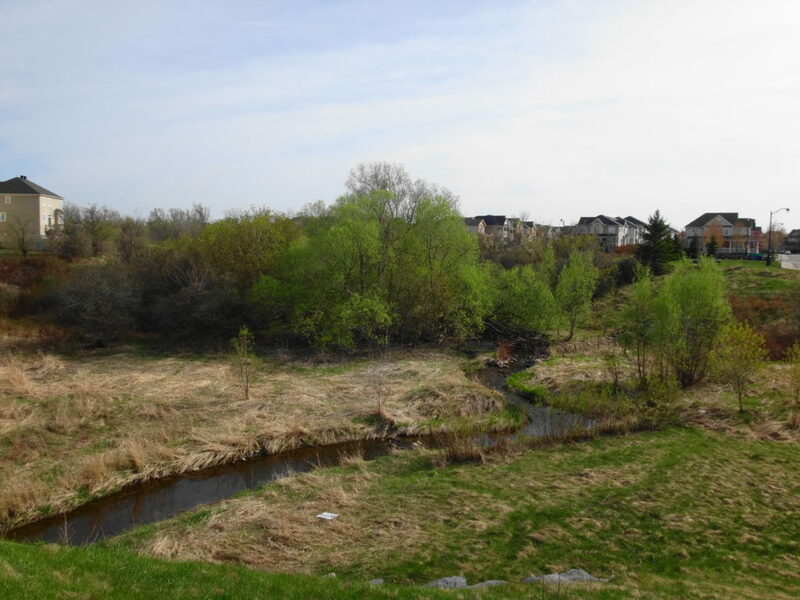 From the wetland, the Creek runs through the Amberwood Village Golf and Country Club, finally emerging back into the public realm at Springbrook Drive. You can bypass the wetland and golfcourse by following the trail out on to Beechfern Drive (crossing a pretty little bridge on the way), and then taking every left turn until you arrive at Springbrook. Along the way, you will follow a short, pretty trail between Hesse Crescent and Pine Bluff Trail, crossing a bridge over a small tributary. The bridge provides a good place to pause and watch dragonflies, or listen to chickadees and common yellowthroats singing in the shrubs. The trail picks up again on the north side of Poole Creek, where it crosses under Springbrook Drive. This is a good place to see the impact of emerald ash borer on Ottawa’s urban canopy. Where the trail once entered a shady grove, it now passes through a bright, open woodland, dotted with the stumps of ash trees. Killed by the little, invasive green beetle, the dead trees posed a safety hazard to the children and other residents using the trail. Although shocking at first glance, the clearing will soon be hidden by the growth of new shrubs and trees taking advantage of the abundance of light. The stretch of Poole Creek between Springbrook Drive and Sweetnam Drive may be its prettiest section. The creek burbles happily through the forest, then crosses under a footbridge into an open wetland. On the south side of the creek, where the trail runs, some adjacent residents have taken it upon themselves to clear a small grassy area down to the creek bank. Normally, the City frowns on such incursions into public natural areas. In this case, though, the lawn provides views up and down the creek, allowing greater appreciation of the marshy floodplain. 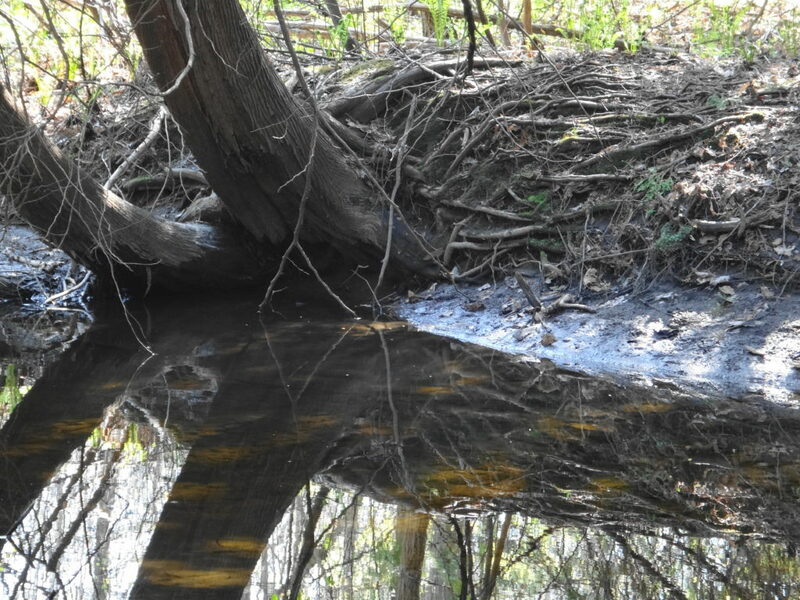 In past years, beavers dammed the lower end of the reach, creating a pretty pond, which the City managed through use of a “beaver deceiver” to prevent flooding of the trail. Although they have now abandoned the site, the beavers will no doubt return in the future. In the meantime, the area still provides a wonderful place to observe birds, including the occasional great blue heron hunting frogs along the creek, or a Cooper’s hawk hunting unwary snakes. A quiet, careful observer might even find painted turtles sunning themselves on the banks. Past Sweetnam Drive, Poole Creek changes character again. After a short run out of sight, it crosses under busy Hazeldean Road and enters one of the City’s newest neighbourhoods. Where it once meandered through farmland, the creek nows winds between recent or still-developing subdivisions. 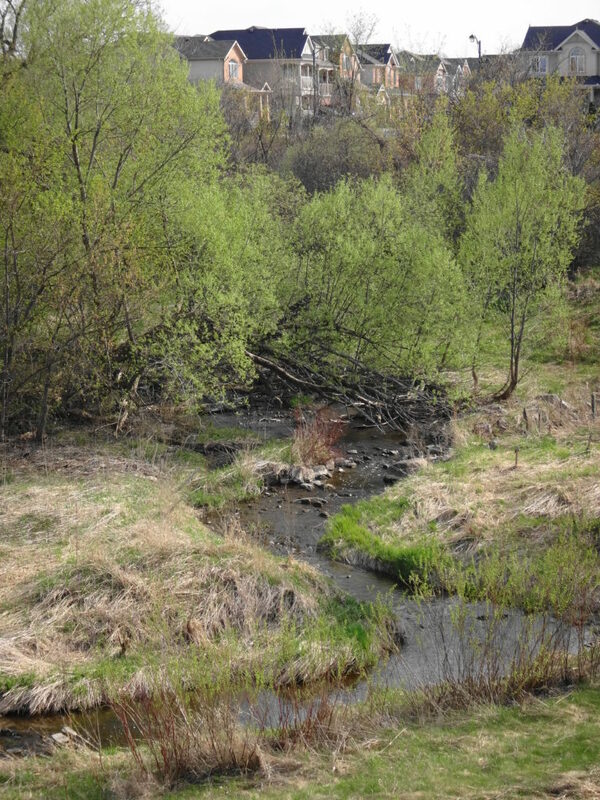 Deeper, clay soils have allowed the creek to carve a valley dense in places with Manitoba maple, crack willow and thorny thickets. Following the creek becomes more difficult. With construction still underway, the trail remains incomplete. Good vantage points exist up and downstream of Huntmar Drive, beside one of the established subdivisions. At first glance, the view in this area seems uninspiring. With a few exceptions, the creek exhibits little of the primordial wildness of the upper reaches. The nearby homes look down into the valley, which appears sadly exposed. Such a perspective ignores what the creek has been and what it will become. In the past, when farmland lined the creek, the grassy valley provided pasture for farm animals, who would water in the creek, trampling and eroding the banks. Animals would defecate in the creek. Grazing maintained an open valley, exposing the creek to continuous sunlight and warming the water. 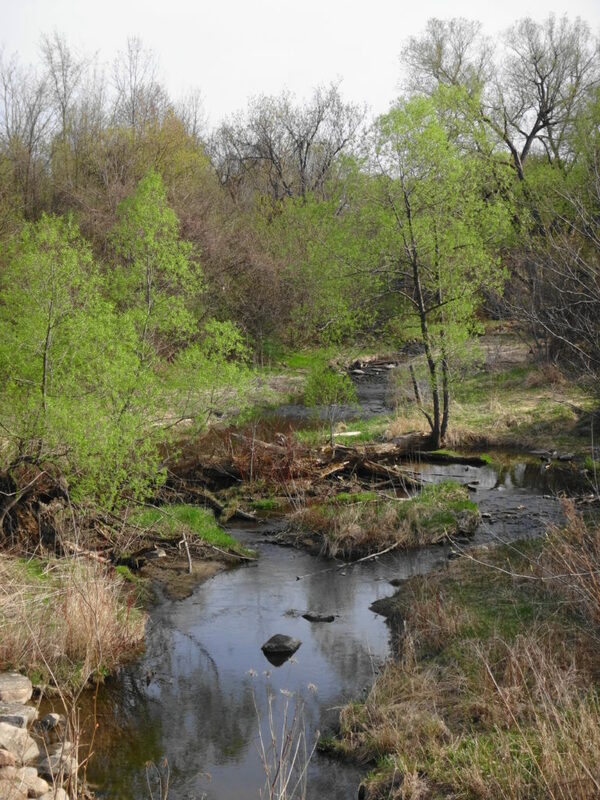 Although much of Ottawa’s agricultural community has embraced new, sustainable animal husbandry, such conditions still exist in some other creeks in Ottawa’s rural area. We see the impacts as poor water quality, dismal aquatic habitat, and low native biodiversity. Lower Poole Creek reminds me of the Don Valley, in North York, where I lived for year in 1975. I recall the matted grasses along the riverbank in the spring, when the ice had finally melted. I recall the dusty, dirt tracks on which we rode our bicycles, which turned to mud in the slightest rain. When I visited that same site in summer 30 years later, I did not recognize it. Where I’d known a wide, open, baking hot valley, I found a young forest and a cool, clear creek. The same transformation will occur along lower Poole Creek. Already, the local developers, the City and the Conservation Authority have planted hundreds of trees, which will stabilize and shade the creek banks as they grow. They will plant more trees, and nature will play its own role, filling in the spaces. By the time that the children in the neighbourhood have their own children, they will marvel at the changes. A forest will fill the valley. Spring mornings will sparkle with birdsong, and along secret ways, wildlife will follow the water. Poole Creek demonstrates why my fellow environmental planners and I fight so hard to conserve and restore urban creek and stream corridors. We often hear, “it’s just a ditch” or “it’s not worth protecting.” In almost every case, we find ourselves having to justify the few metres required to protect these places. We fight these battles not only because that’s our job, but because we see what these space will be in the future: places of refuge for people and wildlife, where children can explore, lovers can embrace, and fish hide in shaded pools.